The English Inn, our Eaton Rapids Michigan Bed and Breakfast, is just 30 minutes from the Michigan Capitol, the Michigan Historical Museum, and the Hall of Justice. We all admire these buildings as we travel past them, but it’s good to be reminded that it is possible to tour them, as well. 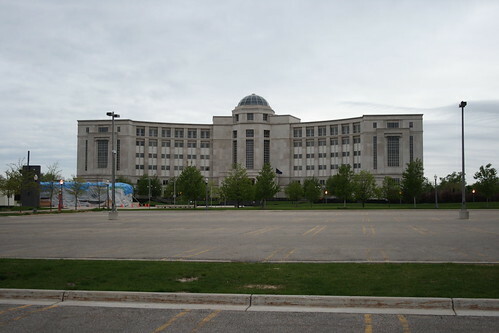 Visit the Michigan Hall of Justice. A good place to start is the Michigan Historical Museum, located near the Capitol and the Hall of Justice. The Museum contains many items from the state’s past, from the First Peoples who lived here prior to the arrival of Europeans, to the present. Special Exhibits change frequently. For up to date information, please visit Michigan Historical Museum. The Michigan Hall of Justice is truly splendid. This six story limestone masterpiece, crowned with a glass dome, stands at the west end of the capitol mall. The words “freedom, truth, equality, and justice” are etched in the marble entrance, an invitation to citizens. Walk-in visitors are welcome, and refreshments may be found at a café in the south wing. Tours are available for groups of eight or more; please call 517.373.7229 for reservations. The Michigan State Capitol is no less impressive than the Hall of Justice that faces it. The rotunda is a work of beauty, seen from the outside or from the floor beneath it. The Michigan State Capitol welcomes visitors. Tours are offered frequently, though they do tend to fill far in advance. Tour Information is available at Michigan State Capitol. Whether you are staying at our Bed and Breakfast near Lansing for business or pleasure, you will surely enjoy visiting the Michigan Capitol, the Hall of Justice, and the Michigan Historical Museum.